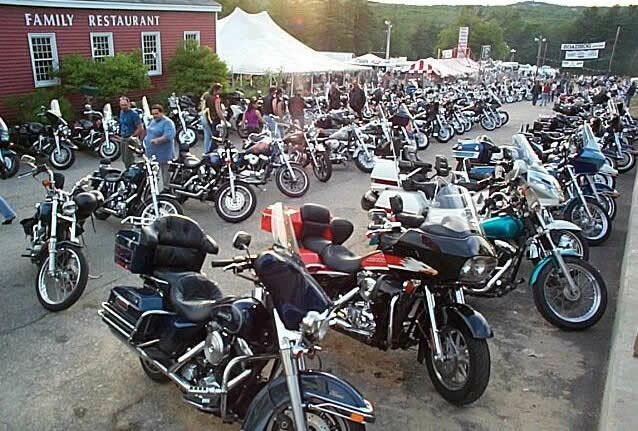 Located on Route 3, in the heart of Weirs Beach, Pine Hollow Camp Ground is where it all happens. "Hooters Lane" in front of the campground, Laconia Rally Week headquarters a mile a way, the boardwalk on Lakeside Avenue. Closer still are vendors selling and swapping bike parts and accessories, t-shirts, pins, patches, belt buckles, leather and lace, tattoos, and of course beer amongst other Bike Week stuff.